The Global Communications Awards will sponsor four projects through 2019. The Texas Tech University Center for Global Communication has announced the winners of its Global Communication Awards, which provide funding to enhance undergraduate education in the realm of global communication. “While Texas Tech has received national recognition for scholarly research and innovation with the university's recent reclassification as being in the Highest Research Activity category by the Carnegie Classification of Institutions of Higher Education, perhaps less well-known, albeit equally important to the ongoing mission of the university, is a commitment to undergraduate education,” said Paul Paré, director of the Center for Global Communication. Whether to address current global challenges, such as tracking and abating the spread of human diseases, or identifying evacuation routes in cases of natural disaster, in this initiative, participants will train to link digital media with geospatial technologies through an international network already established by a YouthMappers Initiative and university collaborators including Texas Tech. This pragmatic multi-college project led by Patricia Solís, Carlos Portillo, Guofeng Cao, Linda Jones Cameron Griffith, Lauren Griffith and Daniel Carpenter will involve faculty from the colleges of Arts & Sciences, Agricultural Sciences & Natural Resources and Education. Anticipated participation will include 200 Texas Tech undergraduate students per year. For Texas Tech engineers working on capstone projects, in this initiative, students will skype with peers in India and the Ukraine to examine ethical practices in their field. This project will enable Texas Tech students to communicate on a global stage in effective, ethical and authentic ways through the exchange of ideas across national boundaries and cultures. The multi-college project led by Roman Taraban, William Marcy and Sukant Misra includes faculty from the College of Arts & Sciences, the Edward E. Whitacre Jr. College of Engineering and the Office of International Affairs. Anticipated participation will include 50 undergraduates per semester. With many modern conflicts fueled by tensions that emerged from human differences, human identity can quickly become pronounced and debated with conflict. Individual, collective, cultural and national identity can lead to conflict through the lens of language, music, space and media. 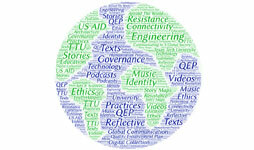 Participants will work with Texas Tech faculty and invited experts to produce a digital collection of texts, videos, digital stories, podcasts and music to explore identity and conflict. This multi-college project led by Allison Cattell, Sarai Brinker, Idoia Elola, Andrea Jonsson, Belinda Kleinhans, Kent Wilkinson and Julie Zook includes faculty from the colleges of Arts & Sciences, Architecture, Media & Communication, the J.T. & Margaret Talkington College of Visual & Performing Arts and Texas Tech Libraries. Having students pooled from existing courses will ensure robust student engagement of about 250 Texas Tech undergraduates per academic year. For students seeking to explore the balance between anarchy and global governance, in this initiative, participants will identify mechanisms for maintaining peace and civility on the world stage through readings, lectures, guest speakers and conferences. Students participating in the political science course POLS 2306 will enhance communication skills by generating archival work addressing and exploring global governance. The Arts & Sciences initiative will be led by Kristina Mitchell. Student participation based on a required core course will ensure widespread engagement. The Center for Global Communication (CGC) provides funding to enhance undergraduate education in the area of global communications through programing, educational activities and scholarships.